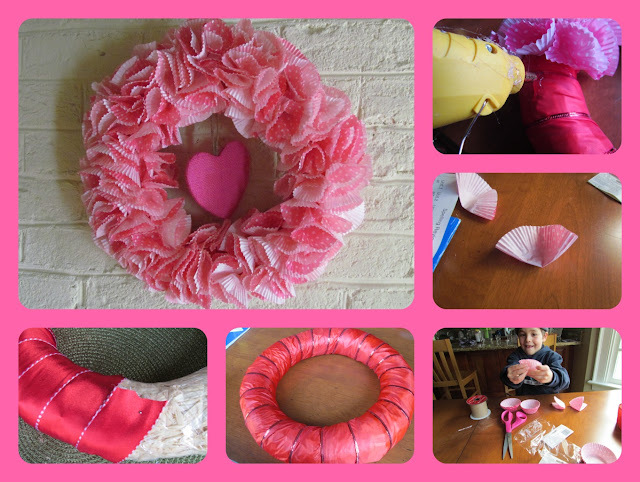 I pinned a cupcake liner Valentine’s Day wreath from Pinterest last year, even bought a package of cupcake liners. Funny I still found them in my craft closet. This Valentines Day I was determined to try it and had my boys home for a Teacher workday. I forgot how fun it was to craft with kids at home. Isn’t this is what most boys want to do on a day off from school?…Craft. I actually think they had fun (they probably don’t want me to admit that) and it made this project a breeze! This project cost about $10, less if you don’t buy any extra decorations. I found the ribbon at the Dollar Store, I needed 2 rolls. Feel free to use up any leftover Christmas ribbon too. We purchased a 14 inch hay wreath and kept it wrapped in the plastic. I had a 40% coupon so that helped too. ($2.50 after discount) The cupcake liners were $1.99 for 75. Not knowing how many I needed I purchased 2 packages. We can always use cute cupcake liners. With the boys eagerly helping, this project was done in less than an hour. I think it was actually 30 minutes. After looking at various blogs, we decided to turn our paper liners inside out. (some do not suggest this) The boys helped wrap the wreath in ribbon, using a straight pin to keep it in place. 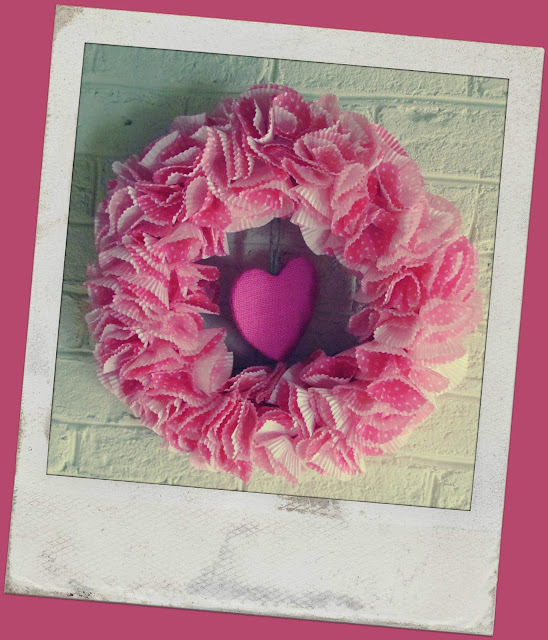 The boys then prepped the liners and I glued them in different directions around the wreath. We added the hanging heart on the back with a stick pin and used a little of the handle to make a hanger but you can also use extra ribbon to hang it. I THINK IT CAME OUT GREAT. You could use a variety of different paper liners to make a wreath for different holidays or seasons. 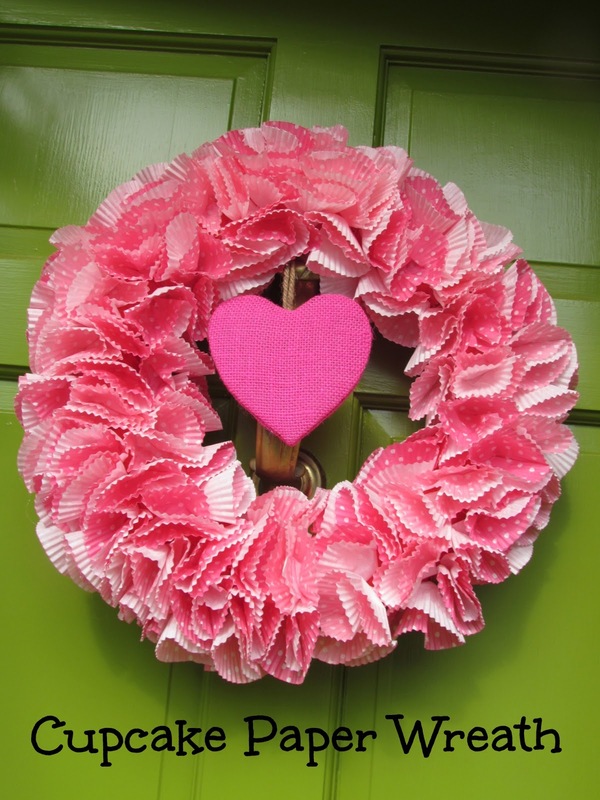 Take out the heart and this would be a fun wreath for a baby shower!! This Valentines Day Wreath will remain indoors however which is one bummer. Also love PicMonkey for editing this picture. Wow I love it!! It looks like it was fairly simple too. Might have to try this one!